In part 1 of his interview with Savera R Someshwar and A Ganesh Nadar, M R Narayan Swamy, the author of two well-researched books on Sri Lanka. Inside An Elusive Mind: Prabhakaran and Tigers of Lanka: From Boys To Guerrillas, spoke of where Liberation Tigers of Tamil Eelam chief V Prabhakaran went wrong. In the second and final part he speaks about the impact of Prabhakaran's death on Sri Lanka and India. Post-Prabhakaran, what is the future of Sri Lanka? My feeling is that, irrespective of whether Prabhakaran is there or not, until unless and until Sri Lanka decides they need to build a nation state, there will be no peace in Sri Lanka. I am not just talking about the violence. You cannot have social peace when a section of the population (the Tamils) feels we are not really part of the state, we are not respected, we are not given dignity. That's not peace. 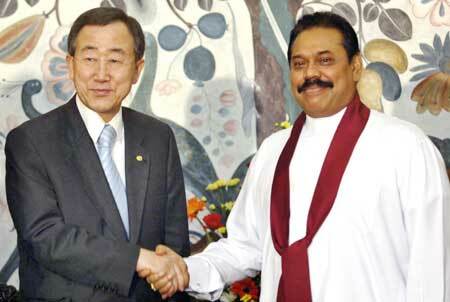 For you to have peace, the Sri Lankan state has to turn into a nation state. It has to give the impression that it is turning into a nation state. It has to prove in practice that it is a nation state. It has to go away from that idiom and ideology that we are a Sinhala-Buddhist nation and that Buddhism is the dominant religion. You might allow others to have their religion, their religious practices, but they have to offer real freedom -- and that's where I would think India is a good example. For all our faults, we are a nation state which Sri Lanka will have to become. The Sri Lankan state has finally vanquished the LTTE. If they are in their senses, they could reform or otherwise they could just go on and on. How does Prabhakaran's death impact India? You can look at what Prabhakaran did vis-a-vis India. He fought against the IPKF but that people may have overlooked. He killed Rajiv Gandhi. And, as far as the security establishment was concerned, there were several other things that the LTTE did which cannot be forgiven. Number one was that he trained insurgent groups from India, including United liberation Front of Assam. 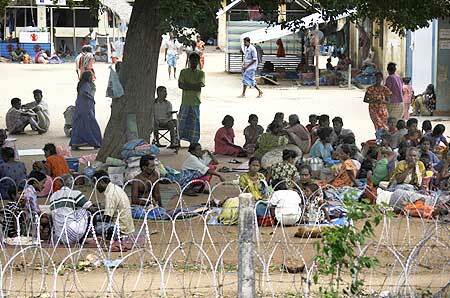 The LTTE also trained insurgent groups in Tamil Nadu including a group called the Tamil National Retrieval Troops. These are obviously the reactions of a Prabhakaran who thought he should also take on India so that India never again interferes with the Sri Lankan Tamils. If you look at it from a purely narrow Indian state point of view, I think they would say good riddance; sorry he is no more but good riddance. Prabhakaran, at the end of the day was probably one man who proved the popular notion of Tamils being very weak wrong. The methodologies he adopted to prove this were not correct, but I think he could be remembered differently. Once the LTTE ceases to exist, assuming it ceases to exist, it will cease to have an impact on India and Indian policy makers. But there could be one problem. Leaving from Colombo to the west will be near impossible in the absence of proper identification and passports. This would mean that there is a big possibility that a large number of people trained in the use of arms and ammunition would come to Tamil Nadu as refugees and eventually settle down. If they live happily ever after without any differences, there is no problem. But otherwise, there could be problems. How is the Congress going to react to this? They seem to have taken the stand that the affairs of the Sri Lankan state are more important to us than the affairs of the LTTE. In the last three months, this was very clearly visible as senior people in the government of India publicly started describing the LTTE as a terrorist organisation. This terminology was confined until now only to the annual reports of the home ministry. So much so that people like Subramaniam Swamy and J Jayalalithaa often wondered whether this woman is actually the woman whose husband got killed on May 21, 1991. But in the last three months, the Indian state has obviously tilted very formally, visibly, physically to side with the Sri Lankan state. What do you think should be India's stand at this point? The government stand has been that one point we cannot compromise on is the settling of the legitimate Tamil grievances. In my opinion, it is a correct stand assuming you are able to translate it to its logical conclusion. 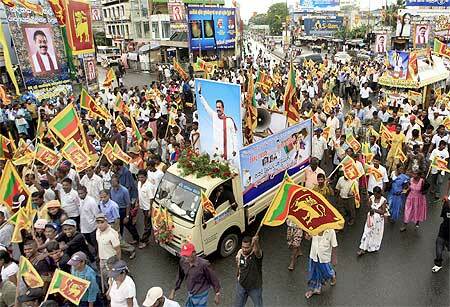 If you are able to make the Sri Lankan state give Tamils their due, then that would be an ideal stand. Can they do it? I don't know. There are certain limitations. One, of course, is the fact that Sri Lanka is a sovereign nation and we cannot tell them what to do. And the fact is that, ultimately, and this was stated very beautifully by one of the Norwegian peace-makers: People think because we have intervened, and because we have intervened in Ireland and other places, automatically our entry means peace in Sri Lanka. It's not so. If the two protagonists do not want to make peace then no peace can come with Norway, without Norway, with India, without India, with America, without America, with God, without God. Ultimately, unless and until the Sri Lankan state, which keeps saying I am the only lord and master of the entire mass of Sri Lanka, genuinely believes it has to give a fair deal to the minorities, the Tamils included, no amount of pressure from you will work. Already the language, the lingo coming from Colombo is that outsiders do not understand what the war is about; we will only have a home grown solution. That is perfectly fine at one level. But it could also be an excuse not to do what needs to be done because it sounds very nice. It all depends on what the Sri Lankans ultimately want to do. They could just sit back and say we have won the battle. Some of them have already said there is no ethnic problem in Sri Lanka, there is only a terrorist problem in Sri Lanka. Once the terrorist problem goes away, there will be no ethnic problem. If you take that to its logical conclusion, it means there is no problem. The problem is over. They could have killed Prabhakaran earlier but they waited for the polling in Tamil Nadu to end. Was this orchestrated by the Indian government? The end was too well-timed. The end, I don't know. It is perfectly possible what you are saying could be true. Although, in fact, I was very surprised by the results in Tamil Nadu because I thought it would be much more favourable to the AIADMK alliance because of the Sri Lanka factor. So I really cannot comment convincingly about that point. I have also been convinced for a long time that, even assuming India had taken a very strident stand and told the Sri Lankan state that look, if you don't stop this war, this is what we are going to do, we are going to cut off diplomatic relations, the Sri Lankans would have said please cut off diplomatic relations, there is no way we am going to stop the war. Look at it from the Sri Lankan state's point of view. For the first time, it gets an opportunity to crush the LTTE beyond recognition. If you are the Sri Lankan state, would you let go of the opportunity? You won't.